Originally posted at 'Orlando Paranormal Examiner'. Studio Six was a CIA front during a 1979-80 deception operation. 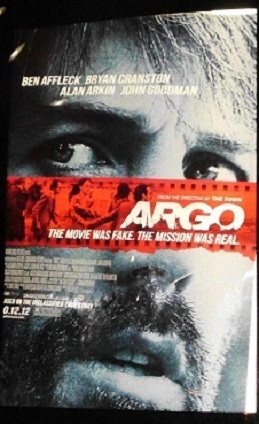 The 'Argo' script itself served a purpose and a film was never actually produced. In 2012, a movie of the same name was released and based on events surrounding the original operation. For those who have not seen the film, opening shots take viewers through Persian history and its eventual clash with the West. A narrator explains Iranian traditional perspectives and the manners England and the States questionably intervened in Iranian affairs circa 1953. “That's not true!” a man who sat to my left blurted out in protest. The film quickly progresses to the 1979 storming of the U.S. embassy in Tehran. Angry Iranian demonstrators surround the grounds, eventually breaching the gate. Embassy occupants struggle to most wisely use what precious moments remain before the impending confrontation with the mob. Scenes include embassy employees frantically destroying classified material and weighing decisions of potential life and death proportion. “Oh,” a woman to my right gasped in distress. So began my viewing of 'Argo'. Bankrolled by Ben Affleck, George Clooney and Grant Heslov, the politically sensitive film is apt to invoke emotional spikes among viewers. The film starred and was directed by Affleck, and won Golden Globe Awards for Best Motion Picture – Drama and Best Director. One of the more artistic and impacting scenes in the movie was a script reading conducted by actors portraying spies portraying filmmakers – or something like that. They read sci fi lines which were mixed with shots of footage of actual newscasts of the day, along with shots of actors portraying American hostages and Iranian captors. The combined effect of an unfolding variety of film and audio - in which actuality and reenactments increasingly mingled as one - left the viewer with a pronounced uncertainty of the extents the entire saga may have been conducted for cameras and to influence spectators. I particularly found the effect of the scene thought provocative that was achieved by the intermittent addition of lines about alien wars of worlds. Tony Mendez and Joshuah Bearman were identified as consultants in the film credits. Bearman wrote about the original saga in a 2007 'Wired' article, 'How the CIA Used a Fake Sci Fi Flick to Rescue Americans From Tehran'. His work is attributed with inspiring the 2012 film script. Bearman is an editor for 'LA Weekly' where he maintains a blog. He has written for such publications as 'Rolling Stone' and 'The New York Times Magazine'. No stranger to the Fortean community, Bearman has also written extensively about the legendary Yeti. Bearman also wrote about the role of professional makeup artist Robert Sidell in the operation. Sidell posed as producer while manning phone lines, fielding press inquiries and handling similar such responsibilities. The Tinseltown veteran was nominated four times during his career for an Emmy Award, including once in 1980 for his work with Chambers on the sci fi television show, 'Beyond Westworld'. He also received nominations for his work on the shows 'The Waltons' and 'Dynasty', as well as the 1982 blockbuster film, 'E.T. The Extra-Terrestrial'. Mendez stated in 'A Classic Case of Deception, CIA Goes Hollywood' that while employed with the CIA Office of Technical Service Disguise Section he engaged the services of many consultants in the entertainment industry. He further stated such consultants were “masters at working the Hollywood system” and indicated their expertise was extremely beneficial during the 'Argo' operation. Mendez and the CIA obviously maintained a presence in Hollywood. What's more, such connections were demonstrated to have multiple, evolving purposes as situations and objectives dictated. “Several black-bag deliveries” of cash were used to set up Studio Six, he reported. A CIA contract officer was enlisted to witness cash deliveries, “follow up as bagman” and similar such responsibilities. “It would take two years to clear all accounts on these matters,” Mendez explained. He further explained that at one point an embassy hostage rescue was seriously considered in which Special Forces could possibly infiltrate Tehran using the same Canadian film crew cover that was at the time being developed to exfiltrate the six. “We imagined that it might be possible to conceal weapons and other material in the motion picture equipment,” he wrote. Mendez and his accomplice to Tehran each received the prestigious Intelligence Star award. Mendez was also later honored as a CIA Trailblazer. Chambers was eventually granted the CIA's Intelligence Medal of Merit, a recognition rarely bestowed upon non-staffers and quite possibly as likely due to his collective service as any given single operation. Such circumstances as contained in the 'Argo' saga provide us with a great deal of potential food for thought. Researchers James Carrion, Mark Pilkington and Dr. Jacques Vallee, to name a few, have served up such dishes on occasion. Carrion, a former military intelligence analyst, suggested deception operations might well cross paths with ufology from time to time. Mission objectives could be as complex as took place surrounding 'Argo'. Such operations might be particularly difficult for a UFO community to understand that collectively tends to think in rather limited terms, suffering from tunnel vision while generally failing to consider broader contexts and the significance of global affairs. Writer Pilkington told 'U.S. News' that his research led him to conclude that virtually every aspect of UFO lore has been exploited and deliberately seeded into popular culture by the American intelligence community. He explained that UFO stories sometimes provide cover for such circumstances as clandestine aircraft. Pilkington further suggested IC exploitation of UFO lore may sometimes be related to deceiving adversaries into fearing non-existent super weapons, a possibility Carrion also researched extensively. The renowned Vallee has long questioned the extent the IC influences ufology, though the UFO community typically limits its perspective of Vallee to his paranormal-based points of view. In more recent years he published a most interesting series of blog posts on the likelihood some crop circles may be linked to deception operations and social experiments. Ufology largely averts from such work and gives it minimal discussion. On a related note, Dr. Michael S. Heiser of 'UFO Religions' directed our attention to the manner some self-described paranormal researchers play the persecution card in lieu of addressing true rebuttals. Discriminating thinkers have lost patience with supposed investigators who complain they have been forsaken by mainstream science, when, in fact, there is actually plenty of qualified review that such investigators just refuse to accept and competently address. Dr. Heiser authored the novel, 'The Facade', and has been interviewed many times by such media outlets as 'Coast to Coast AM'. He published the paper, 'The Majestic Documents: A Forensic Linguistic Report', an objective assessment of supposed MJ-12 documents. The piece contains results of scientifically conducted linguistic tests that are most damaging to the possibility the documents could be authentic. We might particularly choose to chew on the matters revealed in the 'Argo' saga when we consider the extent people tend to form their beliefs due much more to what they see at the movies and watch on television than the results of professionally conducted research. What's more, the gap between ufology and science fiction is a short distance indeed. We might be wise to question how extensively and for what specific reasons the IC has been involved in other sci fi productions, as well as UFO-related entertainment products, conferences and events in general. Please join me in considering the recent award-winning film, 'Argo', as I continue to address the involvement of the intelligence community in movies. In this three-part series of posts we will contemplate a fascinating saga of a CIA deception operation in which script and reality literally intertwined. Interesting as the operation was, however, it is not my primary point to address. My point is to cite the saga as an example of the intelligence community, or IC, tampering in science fiction, and invite readers to consider the extents some may suffer from short-sightedness when attempting to analyze such tampering. I suggest that interested parties would be well served to consider there are many potential reasons the IC might have a presence not only in the sci fi genre, but in ufology and similar such other media, far beyond the reasons typically discussed. The 'Argo' saga provides us with just such a circumstance for review. In order to proceed with such considerations, we must first take a look at what, for those unaware, was the apparent remarkable execution of a brilliant deception operation. The artist, both literally and figuratively, was Antonio J. 'Tony' Mendez, who described himself as “a painter first and a spy second.” When not committing his visions to canvas, Mr. Mendez served in the Directorate of Operations and the Directorate of Science and Technology of the Central Intelligence Agency. Tony Mendez was an expert at physically moving people in and out of otherwise hostile regions and conditions, work known within the IC as infiltration and exfiltration. He was called upon in December of 1979 to help with an operation eventually declassified in 1997 by the Clinton administration. The challenge in 1979 was related to the infamous November takeover of the American embassy in Tehran, Iran. Hostages would be held for some 444 days before their release in January of 1981 but, at the time Mendez was contacted in December, 1979, there was yet another problem at hand. In addition to the dozens of Americans being held at the embassy by Iranians, Mendez was informed there were an additional six Americans, five of which had worked at the embassy, who evaded capture and were hiding with the help of Canadian diplomats. The CIA wanted Mendez to assist in somehow safely bringing the six from Tehran back to the West. Mendez described the 1979-80 operation in his work, 'A Classic Case of Deception, CIA Goes Hollywood'. The piece was posted in 2007 on the CIA website and is labeled a historical document. Mendez reported developing an elaborate scheme in which he posed as a filmmaker in order to create cover stories for the endangered six and successfully exfiltrate them from Iran. Mendez proceeded to set up a CIA-funded Hollywood production company, aptly naming it Studio Six. He also enrolled the assistance of a seasoned Hollywood makeup artist to help him navigate the film industry. A science fiction script was obtained, based on a 1967 Roger Zelazny award-winning novel, 'Lord of Light'. Scenes included settings of rough terrain and markets as found in and around Tehran. Mendez found such scenes advantageous to his plan to visit Iran under the guise of searching for locations to shoot the film. The 'Lord of Light' fantasy storyline involved aliens, futuristic humans and gods. Advanced technology was also involved. The story delved into philosophy and metaphysics, contained overtones of Buddhism, Hinduism and reincarnation, and built up to a cosmic war waged for all the marbles. Would we expect anything less? 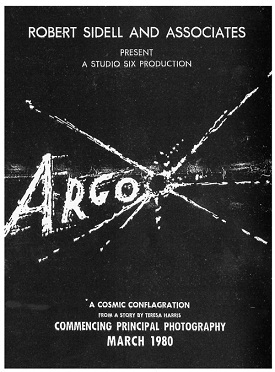 The script was subsequently titled 'Argo' and included the accompanying tag line, “A Cosmic Conflagration.” Mendez explained how money was flashed around Hollywood, events were conducted and press releases were published in trade magazines. Posters were made, business cards were printed and resumes were created, all for the production of a movie that he never had any intention whatsoever of actually making. Mendez and an accomplice flew separately to Tehran in January, 1980, claiming to be leading a Canadian production team searching for a place to film 'Argo'. With the continued help of the Canadian government, Mendez met with the six Americans in hiding, supplied them with alternative identities and provided them with Canadian passports. The resumes supported their cover stories. Posing as a Canadian film crew while the American embassy was under siege, the entourage successfully navigated the Mehrabad Airport in Tehran, boarded Swissair and flew from Iran to Switzerland. The entire operation, from start to finish, amazingly took only about a month and a half to complete. In the novel '1984', author George Orwell described life under a totalitarian regime in which a disingenuous Ministry of Truth regularly rewrote history to effectively promote the state. It might therefore be considered darkly ironic that the Central Intelligence Agency changed the ending to the movie version of the story. The change portrayed a less morally defeated main character than contained in the book and against the specific instructions of Orwell. The CIA apparently did not want movie goers to think Big Brother was all that bad. That was the case according to Frances Stonor Saunders, author of the 2000 book, 'The Cultural Cold War: The CIA and the World of Arts and Letters'. Stonor Saunders further reported the CIA purchased the film rights to Orwell's 'Animal Farm' following his death in 1950. Agents were dispatched to visit Orwell's widow and secure the rights so the Agency could present a more overtly anti-Communist message than the author saw fit to do in his original classic novel. Orwell used a tale of political unrest among animals on a farm to metaphorically suggest the fundamental difference between greedy, power hungry capitalists and greedy, power hungry Communists was impossible to discern, a point that seemed to have sat no better with the actual CIA than it might have sat with the fictional Ministry of Truth. It is clear the media is used for propaganda purposes. The sources of such propaganda may represent a wide range of individuals and organizations, and the range of motives may be just as broad. A review of such events in ufology might quickly turn our attention to insights provided by researcher Robbie Graham. A self-described independent scholar, Graham reports on such topics as processes by which Hollywood's UFO movie content is shaped and the resulting impact on popular perception. According to his Blogger profile, Graham holds a Masters degree with Distinction in Cinema Studies from the University of Bristol and a First Class Honours degree in Film, Television and Radio Studies from Staffordshire University. He maintains the blog 'Silver Screen Saucers', has contributed content and interviews to numerous venues, and has collaborated on research projects with Matthew Alford. Their work includes a 2011 paper titled, 'A History of Government Management of UFO Perceptions through Film and Television', which presents many items of potential interest. One such item involved a 1958 CBS broadcast in which the network subsequently admitted it was subjected to official censorship. During a televised discussion about UFOs in which military officers participated, the microphone of U.S. Navy Major Donald Keyhoe was cut. The major was muted when he made apparently unapproved statements, including suggesting UFOs were real machines under intelligent control. Nine days later, CBS director of editing, Herbert A. Carlborg, acknowledged that “pre-determined security standards were in place” and that deviations thereof were not authorized for release, resulting in the censorship. Graham and Alford inform us that during the 1980's the Department of Defense assisted in the production of a UFO fantasy film for children, 'Invaders from Mars'. The DoD granted full cooperation, including providing Major Fred Peck and Chief Warrant Officer Chas Henry of the Los Angeles Public Affairs Office to assist the director. What's more, a retired public affairs officer, Captain Dale Dye, prepared extras for the film. There are many such examples. Government agencies clearly have certain levels of interest in productions involving UFO-related subject matter and controlling public perception of alleged alien space travelers. The history is long and well documented. Some of the more recent events on the time-line include the splash Chase Brandon made in 2012 when he cannonballed into the deep end of the pool of ufology. Described by Graham and Alford as a 35-year veteran of the CIA, Brandon was apparently employed for some 25 years in undercover covert operations prior to his assignment in 1996 as an Entertainment Liaisons Officer. He was then involved for ten years in shaping film scripts, characters and concepts. Just how influential are intelligence agencies in manipulating UFO-related film scripts, info presented in documentaries and so on? “Very influential,” Graham informed me via email, but that is by no means to suggest Hollywood is entirely controlled by the powers that be, because of course it is not. “Whatever effect UFO movies have on our perceptions of the phenomenon,” Graham continued, “it is largely the result of a natural cultural process whereby Hollywood creatives feed off of existing UFO literature and debate, and incorporate these ideas into their narratives. Just because a film contains specialized UFOlogical detail does not mean it has been produced at the behest of the US government for acclimation or disinformation purposes. More often than not, it means the screenwriter has read one or more books on UFOs or watched some documentaries on the subject and thought it would be cool to incorporate some of these ideas into a fictional story. Identifying motives for the vast majority of investors in film and other forms of media is simple enough. Some want to increase public awareness of topics in which they have personal interests. Some are artists and support the arts. Many, of course, desire to profit from their financial investments. In the case of government manipulation of media and resulting perceptions about UFOs, motives become more difficult to conclusively identify. The fact such manipulation occurs is clear enough, but precisely why it happens is the subject of debate. Some would argue a gradual disclosure of an alien presence is taking place. Others would disagree, suggesting such a gradual disclosure is highly unlikely for reasons including it has seemingly been crawling along at a snail's pace for over 60 years. Others still would suggest government interference in the Hollywood-portrayed UFO phenomenon might be indicative of efforts to cover up an alien presence – not disclose it. Arguments to this effect commonly include citing circumstances of official censorship of potentially relevant events. Those who support such theories and the extraterrestrial hypothesis also tend to suggest the topic is intentionally made to appear silly in an official attempt to devalue its likelihood and oppress serious public consideration. Yet others argue government manipulation of public perceptions about UFOs might be due to it being a scam – that select members of the powers that be actually want us to believe in a nonexistent alien presence. Supporters of this school of thought suggest the intelligence community finds it advantageous to conduct some of its covert operations, such as certain projects involving advanced aircraft or psychological experiments, within the confusion and resulting cover provided by an alien meme. Some suspect the intelligence community has essentially perpetrated an alien hoax for numerous advantageous reasons. Perhaps the truth is found somewhere among and between such possibilities, not entirely within or without any of them. Perhaps certain events indeed involve circumstances that confound many of us, but in reality have nothing whatsoever to do with interplanetary spaceships or their alleged occupants, interesting and fascinating as correct explanations might actually be. And perhaps sometimes the intelligence community indeed manipulates perception of such circumstances for many reasons. Graham suggested cinema is more powerful than television, lingering much longer in the memory. He gives television its due in cultural influence, but described cinema as having a mystical ability to completely detach us from our physical environments while creating a vivid realm of perception. How does Graham assess the overall accuracy of UFO documentaries, films based on true stories and similar such productions? Graham thinks there are a handful of very good documentaries dealing with the UFO issue, including 'Out of the Blue' and 'I Know What I Saw' by James Fox. This would be the case, Graham added, even though Fox himself criticized what Graham termed “the impossibly ridiculous” National Geographic TV series, 'Chasing UFOs', in which Fox appeared last year. As for films, Graham gives thumbs ups to the 1994 TV movie 'Roswell' by Paul Davids, 'Fire in the Sky' about the Travis Walton saga and 'Communion', in which the Whitley Strieber story is presented. The films do not always represent details in entirely accurate manners, Graham observed, but the films are nonetheless memorable and reasonable portrayals of the stories. “So, while some UFO movies are arguably quite accurate in their depiction of certain aspects of the phenomenon, I think it’s impossible for any UFO movie to give an entirely accurate depiction of the phenomenon as a whole because, quite simply, no one in the world can claim to have a complete understanding of what we’re dealing with. Still, it’s fair to say that the vast majority of UFO/alien-themed movies take a considerable amount of artistic license with the UFO phenomenon as experienced by millions of people. And that’s absolutely fine, of course – Hollywood is interested in entertaining, not educating. But we do need to constantly remind ourselves of this fact, especially when watching films dealing with the UFO/ET issue: movies, no matter how realistic they are in the events they depict (and regardless of the nature of the events they are depicting), are not real life. They are, at best, reflections of our reality, snapshots of it, simulations of it, skewed and distorted through the ideological framework of those who have made them. What does Graham think is most important for us to understand about the relationship between the film industry and UFO subject matter? Taking a look forward on the time-line of television and UFOs, we might turn our attention to an item that stated, “We're seeking subjects for the first season of a new TV show for a leading US cable network.” The item specified interest in people who “have had an extraterrestrial encounter, seen a UFO, been abducted” or similar, and was posted on several UFO-related discussion forums and blogs. The post stated experts were available to help, yet provided no details other than a relatively generic hotmail address. However, one website which published the post identified a Lauren James as a contact. Your writer sent emails to the hotmail address provided and requested permission to ask some questions about the upcoming production in order to include responses in a blog post. No replies were received from Lauren James, helpful experts or anyone else, for whatever reasons. While there may of course be many reasons the involved parties might prefer to not field questions about their project, they might nonetheless choose to take the nature of the genre into ample consideration in the future and plan accordingly. Distrust understandably tends to figure rather prominently within the UFO community, and providing reasonable amounts of information tends to be much more of the solution than the problem. Items on the film and UFOs horizon include The John Mack Project, which includes a forthcoming movie from Denise David Williams of MakeMagic Productions. David Williams reports that she secured the life rights to the late researcher of alleged alien abduction, Dr. Mack, apparently giving her exclusive access to and portrayal of the information contained in his books, personal archives, journals, manuscripts and similar such property. Further research suggests the subject of life rights has become increasingly relevant when producing documentaries and films based on what are promoted as true stories. Obtaining such rights stands to become important when telling a story or retelling it if the story has previously been presented in another media or context. Life rights may also become relevant to ensure due consideration and/or compensation is provided to researchers who invest significant amounts of time and resources in a story. A wide variety of individuals, corporations and agencies are clearly competing to influence your beliefs about alleged extraterrestrial visitors, for whatever ultimate reasons. Successfully accomplishing the task has apparently been identified as worthy of substantial amounts of money and sustained effort. Ultimately, we are each responsible for that which we choose to believe, as well as how we arrive at such choices. Please recognize and be mindful of how you make your decisions. Sanctity of free thought should be cherished and encouraged to thrive. Consciously develop your process of making intellectual choices, honor and respect your process, and do not allow it to be overtly or covertly hijacked.